This one day course includes both theory and practical sessions within a relaxed atmosphere that is designed to promote confidence. The Emergency First Aid Course can be adapted to suit a particular audience and is ideal for people requiring Appointed Person status, in accordance with the Health and Safety (First Aid) Regulations. Certification is dependent on successful continuous assessment of the student, there is no formal final examination. Those students who complete the course and are deemed to have reached the required standard are issued with a certificate that is valid for a period of three years. This includes certification and a manual for each student. 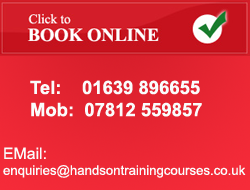 Hands on Training can provide training across all of Swansea and South Wales area including Morriston, Gorseinon, Llansamlet, Fforest-Fach, Pontardawe, Ystalyfera and the rest of the Swansea area.